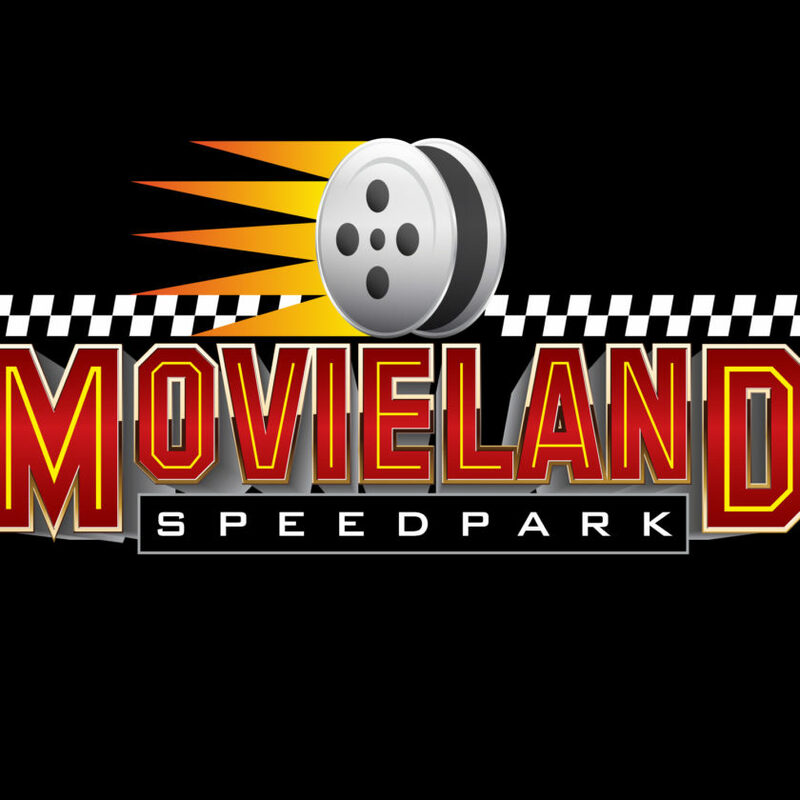 Carnesville, GA – Movieland Speedpark in Chandler, IN will be FASTRAK weekly sanctioned for the Pro Late Models in 2019. The track, which is being operated by Reno Fontana will open with a test and tune on April 12, with the first racing night slated for April 19. 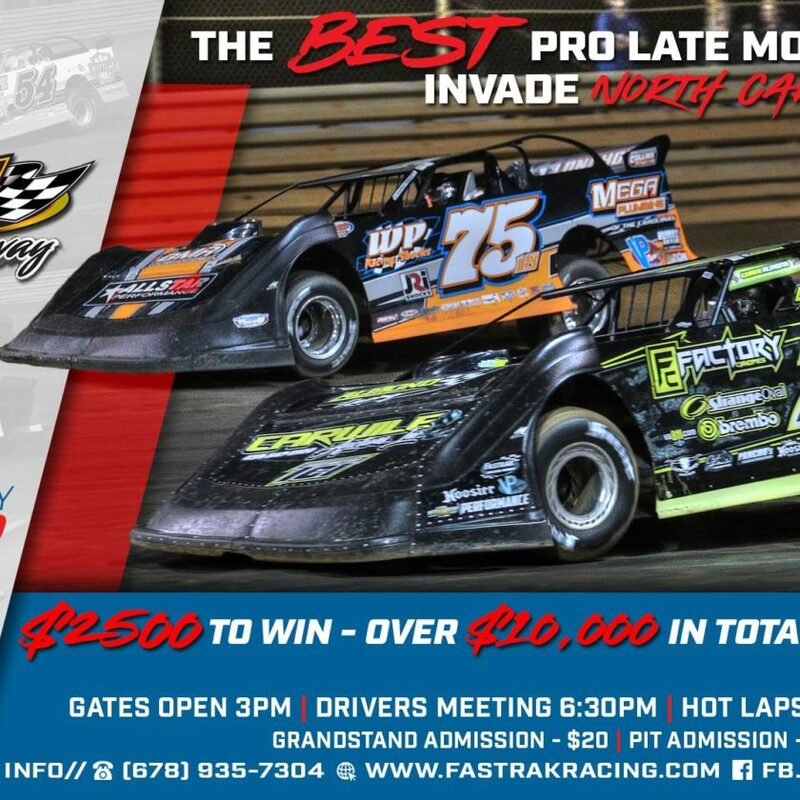 Carnesville, GA – Officials with the FASTRAK RacingSeries have announced that Latrobe Speedway in Latrobe, PA will be FASTRAK sanctioned for their Pro Late Model class in 2019. The track will be operated by Dennis Bates. Teams competing in the FASTRAK Pro Late Model class will be eligible for the 2019 FASTRAK VP Racing Fuels National Weekly Championship as well as a FASTRAK Divisional Championship. Carnesville, GA — FASTRAK Companies International, LLC and Speed51 have announced a partnership that will make Speed51 the Official Video Home of the FASTRAK Racing Series and all regions of the ULTIMATE Super Late Model Series. In the 2019 season, FASTRAK Racing Series powered by Chevrolet Performance rookies will be chasing the “Speed51 FASTRAK Rookie of the Year award”. Select FASTRAK and ULTIMATE events will be live streamed on Speed51 network, which fans can subscribe to. Additionally, Speed51 will offer Pay-per-view options of marquee races throughout the 2019 season. The FASTRAK Racing Series powered by Chevrolet Performance is set for the final two races of the 2018 season. The season will conclude with a Friday-Saturday doubleheader at Screven Motor Speedway in Sylvania, GA. The 2018 Champion will be crowned while drivers compete for their share of over $25,000 in total purse money on November 16th and 17th. The Chevrolet Performance Late Models of FASTRAK will battle 40 laps for $2,000 to win on Friday the 16th and 50 laps for $3,000 to win on Saturday the 17th. The FASTRAK Racing Series powered by Chevrolet Performance will hit the high banks of 311 Motor Speedway this Saturday night for $2,500 to win as part of Dirt Wars. 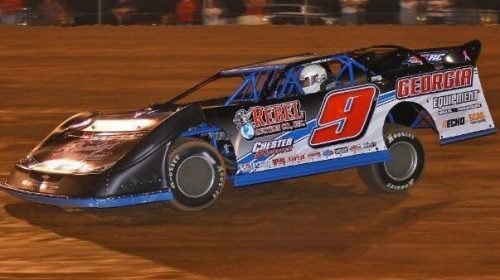 The Stars and Cars of FASTRAK will battle it out on the ½-mile Pine Hall, NC speedplant for their share of over $10,000 in purse money. The race is the final tune up before the FASTRAK World Championship weekend, with a weekend purse totaling over $75,000. 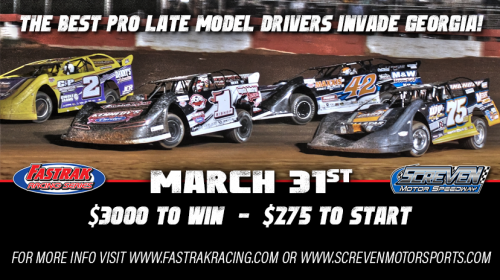 As warmer weather approaches the FASTRAK Racing Series powered by Chevrolet Performance will be heating up on March 31st at Screven Motor Speedway. Drivers will be competing for their share of $12,780, with the winner taking home $3,000. FASTRAK opened the season at Screven on February 17th, and saw Travis Pennington of Stapleton, GA take the checkered flag. When FASTRAK returns to the “Redd” clay in Sylvania, GA, it will be the first race ran under the 2018 rule book. The FASTRAK Racing Series powered by Chevrolet Performance is set to return to Screven Motor Speedway in Sylvania, GA on March 31st for the second race of the 2018 season. 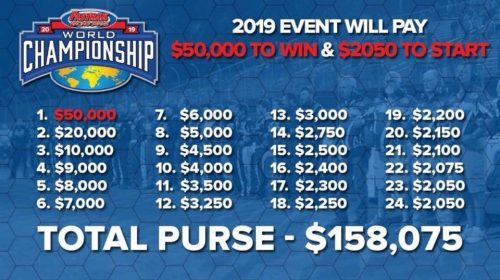 The top drivers in Chevrolet Performance Late Models will hit the “Redd” clay to compete side by side for $12,780 in total purse money, with the winner getting a $3,000 pay day. This race will be the first ran under the 2018 FASTRAK rule book, which will be posted to fastrakracing.com this week. The temperature may be cold, but the season is ready to heat up for the FASTRAK Racing Series. 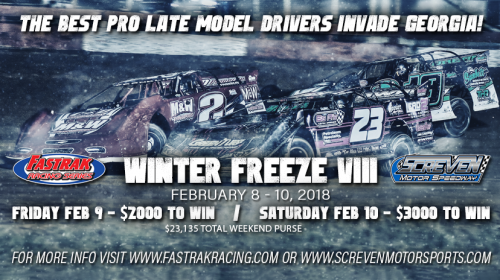 As part of Winter Freeze at Screven Motor Speedway, the Chevrolet Performance Late Models will hit the red clay to battle for over $23,000 in two complete shows. 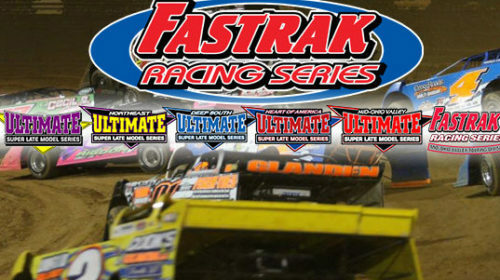 The FASTRAK Racing Series is set to begin its 15th season, February 9th and 10th at the Sylvania, GA race track. Drivers will compete for $2,000 to win on Friday and $3,000 to win on Saturday. At the annual FASTRAK Night of Champions, which saw a crowd of over 200 attendees, Virginia Motor Speedway representative Dave Seay announced a total purse of $158,075 for the 2019 FASTRAK World Championship at Virginia Motor Speedway. The winner of the richest Chevrolet Performance Late Model event ever will be awarded $50,000. The event will coincide with the celebration of the Jamaica, VA track’s 50th anniversary.